Another culinary adventure inspired by another farmer's market trip. 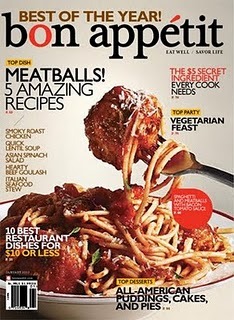 But then I remembered one of my favorite issues of Bon Apetit Magazine, featuring 5 different meatball recipes. I'd already made the pork meatball banh mi - but I had yet to try the mexican inspired soup - a soup that would use up my two poblanos. Now, warning. This is not a quick dinner, nor is it for folks who cannot handle spice. I think I have a reasonable tolerance for heat, and this dish had me sweating....but it was soooo worth it. It did require a couple special ingredients, namely the ancho chile powder - but I managed to find it at whole foods - so save yourself a trip or a bunch of phone calls and just go there. Instead of panko, I subbed homemade breadcrumbs made from another heel of my sourdough bread. And for the beef, I made what at the time seemed like a ridiculous trek through traffic to City Feed and Supply for VT beef. To make the recipe a little less daunting, I made the meatballs the night before we would eat the soup. I rolled them, then put them on a baking sheet lined with plastic, then covered them with another piece of plastic and stored them in the fridge. I find that breaking difficult recipes into smaller steps can make it easier to overcome an otherwise lengthy cook time. And since I was making a soup, I rationalized that the leftovers would make up for it! Friday night after work, I made the soup as directed in the recipe - and subbed brown rice for white. No big deal there. Once the soup was simmering, I just had to drop my meatballs in one at a time. While the soup was cooking with the meatballs, I got to work on my garnishes. I cut 4 corn tortillas into thin strips and fried them in a few tablespoons of canola oil. Although the recipe did not include this instruction, I salted them as soon as they came out of the oil. *warning* do not make more than a serving at a time of these little tortilla strips or you will most certainly eat them all. They are amazing. Once the soup was ladeled into bowls it was topped with the tortilla strips and some cilantro. These albondigas were rich and spicy. Rafe and I both felt very satisfied making this our dinner, and we enjoyed the leftovers for a few days. How do you overcome lengthy or demanding recipes? Do you break them into stages? Do you save them for special occasions? Go all out and eat dinner super late? Or do you avoid them altogether? I'm loving the photographs in this blog post! I like to save my lengthy or more difficult recipes for the weekends. I'll have plenty of time to enjoy the cooking without feeling rushed! I def avoid time consuming recipes. If there's something I really want to put the effort into, I just save it for a day when I know I have the time! this might be one of the most beautiful looking soups ever! your skills impress me and does your dedication to finding quality ingredients. I really like the addition of the tortilla strips. YUM! This looks absolutely incredible. I usually save challenging/involved recipes for Sundays; sometimes we end up eating at 9pm. oh well! This looks like the perfect recipe for a Sunday afternoon. I usually spend those days planning and cooking for the week so I am not scrambling for the rest of the week. Or I will do the laborious prep on Sundays so the rest of the week I can fire things up and throw them together much easier. I definitely break lengthy recipes into parts when I can. Or I'll at least do all the prepping and chopping I can ahead of time. It sounds like I'm much too wimpy for this dish, but it looks so good! I remember seeing that recipe. What did you think of City Feed? I haven't made the trek over there yet. This spicy meatball soup sounds insanely delicious! I love the tortillas on top! I do try to break up the steps by doing something early in the day or the day before if I have time. I generally avoid time-consuming recipes, though I want to try more now that I have time on my hands! These meatballs look amazing, and I am a spice fiend!